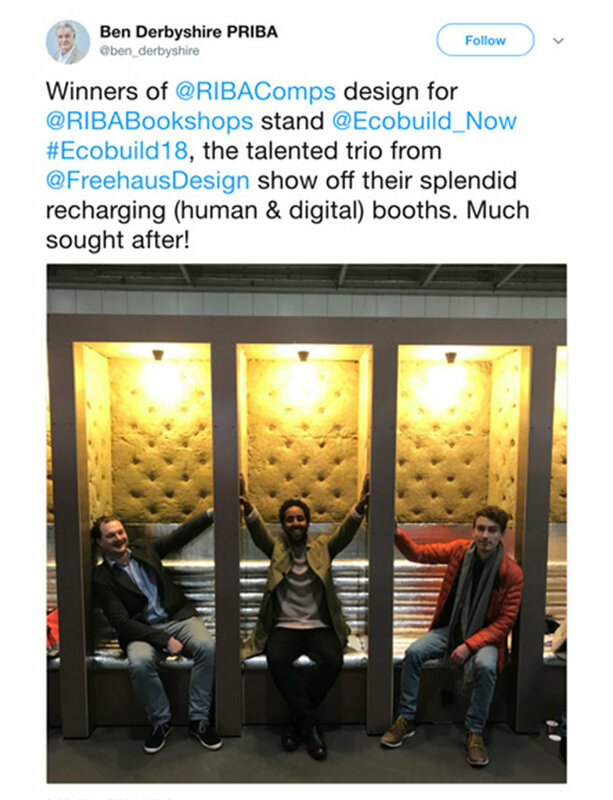 We won an RIBA competition to create an RIBA Bookshop and meeting space at ecobuild 2018, in association with stone wool manufacturers Rockpanel and ROCKWOOL. A fundamental requirement of the brief was to feature Rockpanel and ROCKWOOL as the design key materials. The materials were brought to life by referencing the extraordinary moments behind the creation of these products. The transformation of solid basalt rock to molten ‘lava’ within giant blast furnaces and the pouring and spinning of this volcanic soup in a process reminiscent of making candy-floss. Responding to the material’s insulative and acoustic properties, as well as its integral pliability, the design presented an iridescent curve, which subtly changed colour according to the shifting flow of people and variation of light dividing the space in two distinct areas. On one side the space hosts the RIBA bookshop and an area for public talks, featuring a wall with an integrated sound system. In the second area, a series of niches offered a series of quieter spaces for informal meetings and moments of rest. Throughout the space, a series of mobile plinths explicitly referenced the central moments in the life-cycle of ROCKWOOL/Rockpanel products, offering the visitors a visceral showcase of the product. The stand drew from the functional and technical performance of the materials, as well as its sustainability credentials. ROCKWOOL and Rockpanel products are almost fully recyclable and so they were intentionally used at every opportunity. 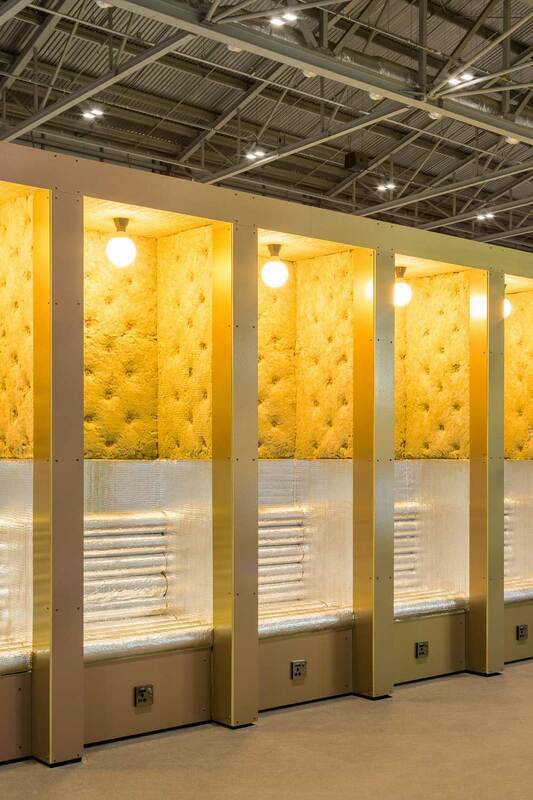 Following ecobuild 2018, the installation was dismantled with the materials broken down and reused to form brand new building materials. The stand was at ecobuild 2018, at ExCel London from Tuesday 6th March – Thursday 8th March 2018. 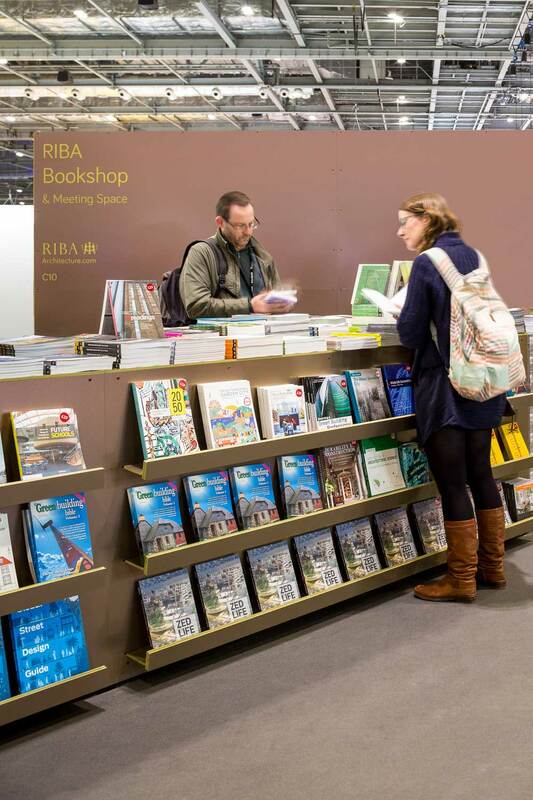 Get your RIBAJ and check the feature on the RIBA Bookshop and Meeting Space. Basalt rock is molten to manufacture Rockpanel and ROCKWOOL products.